Like all political borders, the border between Northern Ireland and the Republic of Ireland exists as a line on the maps that mark out the territory of one state or jurisdiction from another. But borders vary also in the degree to which they are visible on the ground. Borders can be marked by the most impermeable of physical barriers or only noticeable through subtle signs. The Irish border does not separate landscapes, town and villages that are very different in appearance. Instead, a range of subtle and dramatic structures – from road signs to road blocks and watch towers – have marked out the political border in the landscape. 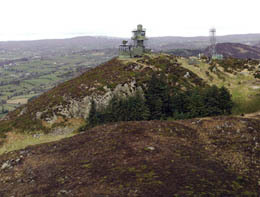 In the case of the Irish border, its visible presence in the landscape has varied over the course of its existence, only evident in the landscape through the custom posts on either side of approved border crossing points in its first decades, but more heavily militarized with fortified buildings, blocked roads, army checkpoints and watchtowers in the Troubles. The degree of its presence in the landscape has also varied along its length, with the more heavily militarized landscapes contrasting with less militarized stretches. Now in many places, especially in its most rural sections, the border is only evident as a seam in the road where the one local authority’s responsibility for road maintenance meets another’s. 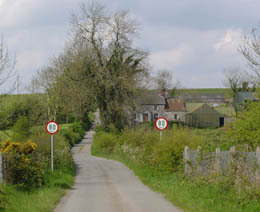 Today different sorts of speed limit signs may most obviously mark the crossing from Northern Ireland into the Republic of Ireland or vice versa. New road bridges have replaced those that were blocked or destroyed to prevent people using unapproved routes across the border. In other places, where the border traverses main roads for example, the border continues to be visible in the shops, currency exchanges and the petrol stations which have sprung up in response to differences in the price of fuel on either side of the border, and have closed as prices have shifted. But the border is visible too in other ways, incorporated into the names and signs of shops, business and bars. The crumbling buildings of abandoned farms that feature in border landscapes, are subtle signs of the social history of the borderlands that includes the departure of Protestants who left their homes because of fear or isolation during the Troubles, and those people who left due lack of prospects or to the practical difficulties of farming near the border. The landscapes of the border counties are now being shaped by new developments which indicate the ongoing existence of the border even through it is mostly invisible on the ground. New large homes have been built north of the border in some areas by people from Ireland taking advantage of cheaper land in Northern Ireland and commuting to Dublin. In other areas large new houses have been built south of the border to take advantage of less restrictive planning regulations in Ireland. Like new road improvement schemes they also reflect the recent greater prosperity of Ireland. Areas near the border are also being affected by the large-scale illegal dumping of waste by those trying to evade restrictions on dumping in Ireland. The border continues to matter on the ground though not in the ways it once did. Follow the links on the left for more about these different regional and material geographies of the border.